Having a great looking tree company is something that many people want, but many don’t get because they don’t invest enough time or effort into it. Having a compound with trees can be one of the best things ever. You will get a chance to enjoy being around your trees, and you will be looking for ways to either increase or prune them so it can look as good as possible. The one thing you will need to deal with is the maintenance. If the trees are not properly maintained, they can become a safety hazard and affect the look of your compound or garden. This is why you need to hire an expert to help you out. An arborist will help you ensure your tree is in the best condition. Proper maintenance of these trees is essential. 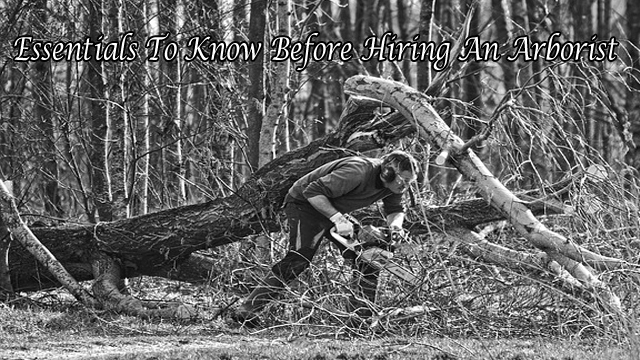 Here are some essentials you should know before you hire an arborist. This is something many people don’t know and don’t expect an arborist to tell you because this means more work for them. It is not necessary to have the trees pruned every three to five years, but you should always ensure a tree that has dead wood has been pruned. This is especially if the deceased branches are of more than two inches in diameter. Watch out for this, and you won’t have to spend money on pruning. If there is mushroom or fungi’s growing on the tree, or if there is a significant limb that has broken off as a result of a storm, consider having tree inspection done before it is too late. This is because it is usually a sign of a more significant problem. If the tree’s branches start to die back from the tips, then the tree is already as good as dead. If you notice that the tree is going straight down like a telephone pole instead of flaring out, then it is another sign. The pricing of services by an arborist will vary depending on some factors, but the most common is the season. There are times when the prices are very high, while there are times when they are very low. If you choose a time when the arborist is too busy, then you can expect to pay a little higher. If the task you want to get done is not time-sensitive, then you should consider having it done during the off-season. If you get a high price in May to cut down a tree, you can also for pricing in winter? Many people are usually excited when they hear there are fast growing trees that will take a short amount of time and will leave the garden or compound looking great. This trees can come in handy, but it is a good idea to be careful with them. This is because they can easily decay, they are weak, and their limbs break off easily by ice and wind. If you don’t want to deal with this issue, then consider investing in quality trees that will be easier to maintain and won’t break easily. Topping was something that was a norm about 50 years ago, but science has continuously shown that it is the worst thing you can do to a tree. Another type of person you should not have touching your trees is the one trying to sell you fertilizer without doing the soil test first. Soils are different, and they need testing before determining the right type of fertilizer to be added. This is the wrong thing to do because it will affect the health of the tree. Every time the arborist takes a step, he is making a wound on the tree, and this will create a decay pocket. Unless he/she is climbing the tree to cut it down, never allow this. When you do this, you are making it hard for the moisture to escape, and this can easily cause the root and trunk to rot more easily. The mulch at the base of the tree should be doughnut shape. There is no need to get surprised when you are told that there is rot. One assumption people make is that trees have giant systems that go deep down till they reach the water table, but this not the case. Most of the roots will reach between 12 to 18 inches. You will need to water the trees, so they remain healthy and not dry off. You should try giving the trees at least an inch of water every week during the dry periods. You need to choose an arborist who has all the necessary equipment. You will find that some arborist will walk around with equipment that cost hundreds of thousands of dollars. This equipment will ensure quality services for your trees. This is one of the reasons why it can be a little expensive to hire an arborist. The cost will be worth the service you get.